The bridge from the past Rohatyn Jewish community to the current city has been sustained by a Rohatyn teacher and historian. We want to build on his efforts, by providing a collection of reference materials and other resources which can be used by local schools to give Rohatyn students a broader picture of the local history than may be available in their textbooks and study aids. And we hope that these same materials may be useful to schools outside of Rohatyn, as example histories of the region, and of intercultural relations in Central Europe, and of heritage as a shared responsibility. We are also developing these materials with an eye to visitors to Rohatyn, recognizing that history tourism can be beneficial to the resident community and to heritage preservation. Overall project cost estimate: $0. Total funds allocated to date: $0. Overall project timeline: January 2017 thru June 2018. Project progress: 0% complete. This project develops a core element of the overall Rohatyn Jewish Heritage program, but involves no material heritage directly and requires no significant physical labor to implement. No money has been raised for this work, and no program funds will be allocated. We hope that this project can be achieved entirely through volunteer efforts and without cost in Rohatyn or abroad. A puzzle in the rubble. Photo © 2015 Jay Osborn. 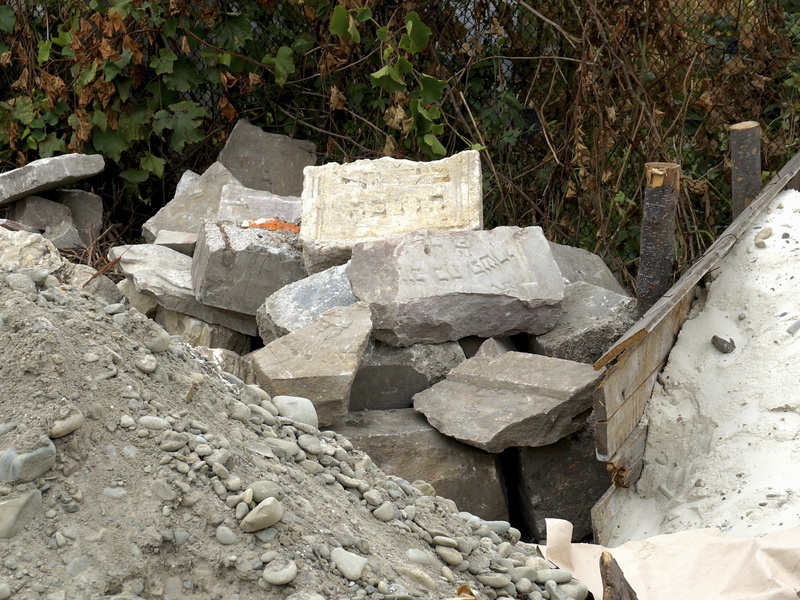 Recently a young man working at a building site in Rohatyn noticed strange symbols carved into some of the stones which had been used in the walls of an old service building he was helping to dismantle and rebuild. He contacted his high school teacher and local historian Mr. Vorobets for advice about the symbols; perhaps it was Turkish writing, the young man thought, probably because he had learned something about the Ottoman presence in town in World War I. Mr. Vorobets visited the building site and recognized the stones immediately as fragments of matzevot, Jewish headstones, taken from one of the Jewish cemeteries in town under Nazi occupation during World War II. The young man had not recognized the carved characters as Hebrew, or the significance of the stones; embarrassed, he immediately offered the stones for return to Rohatyn’s old Jewish cemetery, and then helped to transport them there. We very much want to help this young man and others. Rohatyn had a Jewish community for centuries. 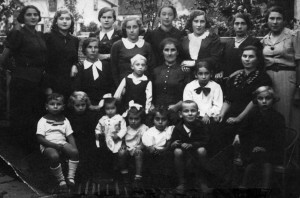 Prior to WWII, the population of Rohatyn had been diverse, with Jews usually making up the largest single group, typically a third to a half of the residents (44% in the 1900 census). 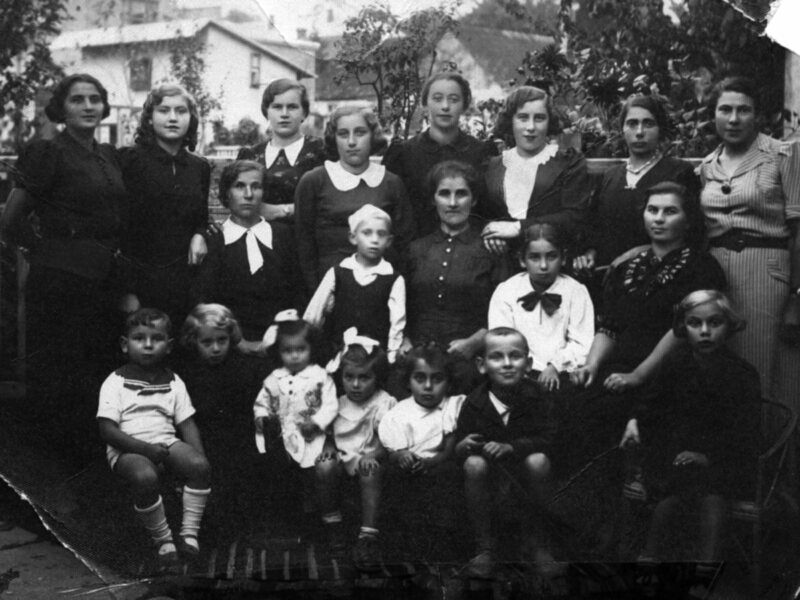 The war destroyed not only the entire Jewish community, but also the visible evidence of the Jewish component of Rohatyn’s past, and the business and personal relationships other residents had had with their Jewish neighbors. The subsequent Soviet government brought in new residents from distant towns who had no knowledge of the pre-war communities of Rohatyn, and discouraged discussion of specific ethnic groups. Only 70 years after the war ended (a small fraction of the full timeline of Jewish history in Rohatyn), it is easy to see how a young man could have little or no knowledge of the once rich fabric of diverse cultures in his town. And the reverse is also true: apart from the small number of Jews born in pre-war Rohatyn who now live abroad, few can easily visualize how the Jewish community was integrated into the Rohatyn of the recent past. And few members of the large Jewish descendant community have visited or are able to visit Rohatyn today, especially for long enough to engage with and appreciate the town’s current residents and their active lives. During visits to Rohatyn to manage issues of the heritage work, we have been approached by residents of all ages with questions about our connection to the town, and about its Jewish past; school teachers there have been particularly interested in what we can share of our knowledge of Rohatyn Jewish families, students, businesses, and life. This curiosity and interest has inspired us to study ourselves, and to gather information and materials which others can use to better understand who we were and who we are. Development of reference materials and study aids on the Jewish history and heritage of Rohatyn addresses the key program objectives of memorial and education, and provides a base on which to build specific educational themes for use by teachers and students. When the first projects are created by local schools, those examples will serve to refine the materials and to suggest future resource and project development ideas. Educational resources will be added to this website as they are developed. No detailed project plan will be written, and no funding is required – this project will proceed on a volunteer basis as time permits, with a projected time period of 6 to 8 months to first full completion, in time for teacher evaluation before the end of the 2015~2016 school year. Additional resources will be added thereafter based on input from teachers and anyone with an interest; all are welcome to contact us with ideas and links to free-use materials. 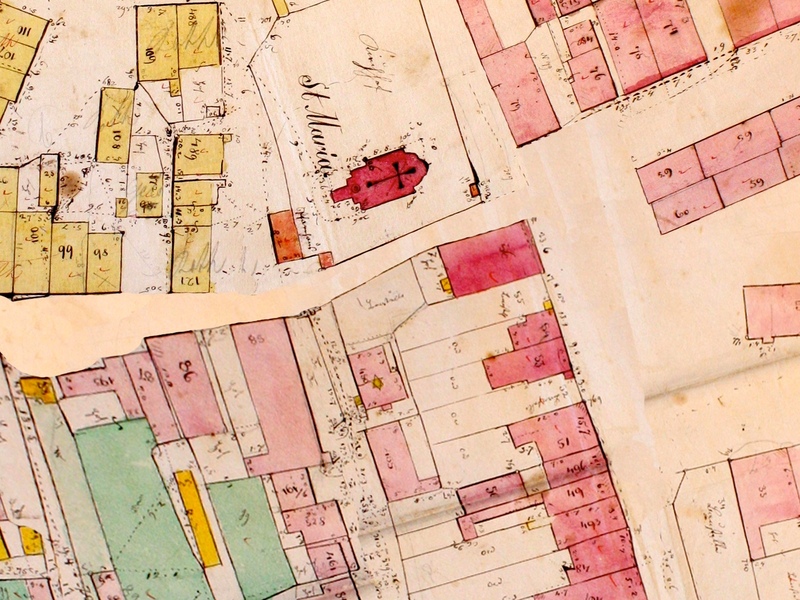 Three initial themes have been identified for assembly and creation of focused educational resources on this site: genealogy, geography, and the history of the Jewish community of Rohatyn. The three themes are related to each other, and to all of the past communities of the town. Jewish Rohatyners in Cherche, 1938. Photo from the Faust-Rothen collection, provided by Alex Feller. Family connections to Rohatyn are what originally prompted us to visit the town, and what keep us coming back. As genealogists, we are interested in the names, dates, lives, and stories of our ancestors, and as historians we are interested in how our families experienced the events and movements of their times. Because of frequent migrations and their huge family losses in the Shoah, Jewish genealogists are especially motivated and many are quite skilled. In this theme, we plan to share our knowledge and resources for family history research, much of it applicable to any of Rohatyn’s past and current ethnic communities, and much of it accessible for free via the Internet. Church and synagogue together at the edge of the Rohatyn market square in 1846. Original map from the Central State Historical Archives of Ukraine in Lviv (TsDIAL); image courtesy of Gesher Galicia. In the several hundred years that Jews have lived there, Rohatyn has been subject to the rapidly changing rules of several empires, on the front lines of several major European wars, and the starting or ending point of significant voluntary and involuntary migrations of people. The Hnyla Lypa river has changed course in town due to natural and economic causes, the population has moved around the town for similar reasons, and rail and telephone lines have accelerated communication within the region and beyond. Many of these changes are documented in historical maps, the languages of which are clues to who was interested in Rohatyn and the region, and why. 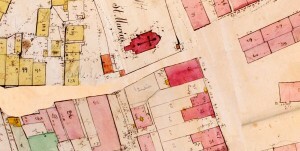 And some of the maps can be combined with other data to give depth to the human dimension of the town over time. All of these geographical resources are applicable to everyone with a connection to Rohatyn, regardless of ethnic origin. Rohatyn Jewish records office. Undated photo from the Barbara and Howard Steinmetz collection. An important resource supporting both the educational and heritage components of our program is the documented Jewish history of Rohatyn. Genealogical and historical research by many people, along with the personal recollections and stories of former residents, has added considerable detail and texture to archival records, histories, and analyses of past events and times. The current residents of Rohatyn, and perhaps others, may be surprised at how much has been recorded of Jewish life in the town, and the number and variety of historical facts and legends which have survived to bridge across time. Our goal is to bring much of this rich material back to Rohatyn, for use by teachers and students and anyone else with an interest. We believe these resources and the opportunities for education they create will help in several dimensions; the important one for us is to connect the surviving Rohatyn Jewish material heritage, a renewed memory of the past Jewish community, and today’s descendants with the modern town and its people and institutions. But we guess there will be many other helpful and interesting facets to the education process supported by these resources. It is hard to predict what other kinds of educational resources may be useful to illuminate the Jewish history and heritage in Rohatyn; we will create web space for these materials which can expand to accommodate future additions. But there are two topics we know will benefit from references and links, even without original research by our volunteers: alphabets and language, and the Holocaust in Rohatyn. The modern Hebrew alphabet. From Wikipedia. During the almost 150 years of Austrian rule over Galicia, there were five major languages used in Rohatyn (German, Yiddish, Polish, Ukrainian, and Hebrew) plus several with fewer users, and three common alphabets (Latin, Hebrew, and Cyrillic). Other languages (especially Russian and Latin) were popular or dominant in other times. Text in surviving records, letters, signs, and other artifacts may appear in any of these languages and alphabets, and sometimes in a mixture, in printed, carved, or manuscript forms. Past residents of Rohatyn were remarkably multilingual, enough for business and political exchanges between the several communities in town. Our aim with this set of resources is to provide easy access to text and graphics to introduce the alphabets and languages which once flourished in Rohatyn and which can still be seen on older features of the town. There is a huge volume of literature on the Shoah, and it is a topic which must be carefully introduced to students who are not yet adults. We will not attempt to address this topic in general except to provide links to resources we have found useful in our own study. But we will try to present the specific recorded historical events in Rohatyn, which damaged or destroyed all of the Jewish families living there during the war years as well as most of the Jewish community’s material culture. Eyewitness testimonies of wartime conditions and events at specific places in town can help evoke the terror and explain the situation at those places today, and may make the wartime events real and meaningful for current residents. No plans have been detailed for this project beyond the concept outline described here. No project costs are anticipated and no funding has been raised or allocated; this project is intended as an entirely volunteer effort, though translation costs may be incurred if the volume of text becomes large. An essential early step in the development of this project will be to identify one or more local teachers, librarians, and/or school and church officials to establish an exchange and to publicize the availability of the resources. As of autumn 2016, the web site to carry the education materials has been established, and the initial focused thematic materials have been identified, along with a first set of additional materials. The volunteer efforts on this project will continue in 2017, following some additional work on other projects in the program.